These are the basic settings. The List View of the objects Particle Modifier(s). Copies the active particle system to all selected objects. Copies all particle systems from the active object to all selected objects. Duplicates the particle system within the active object. The Duplicate Settings option (in the Operator panel) will duplicate settings as well, so the new particle system uses its own settings. The Data-Block menu for settings. Main selector of the system type. In such a system, particles are emitted from the object. Use Hair type, rendered as strands. Regrows the hair for each frame. This is useful when you are animating properties. Enables advanced settings which reflect the same ones as working in Emitter mode. This manual assumes that this option is enabled. Controls the number of parts a hair is made of. Increasing this value will improve the quality of animations. This initial value for random properties can be used to create a look, which is slightly different, even when using the same settings. Create the mesh which will emit the particles. Create one or more Particle Systems to emit from the mesh. Many times, multiple particle systems interact or merge with each other to achieve the overall desired effect. Tailor each Particle System’s settings to achieve the desired effect. Animate the base mesh and other particle meshes involved in the scene. Define and shape the path and flow of the particles. For Hair particle systems: Sculpt the emitter’s flow (cut the hair to length and comb it for example). Make final render and do physics simulation(s), and tweak as needed. 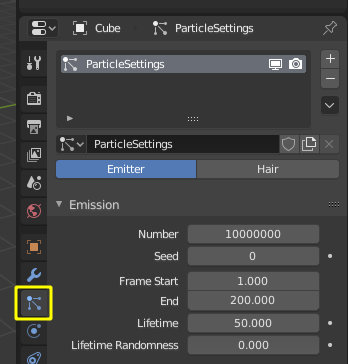 To add a new particle system to an object, go to the Particles tab of the Properties editor and click the small + button. An object can have many Particle Systems. Each particle system has separate settings attached to it. These settings can be shared among different particle systems, so one does not have to copy every setting manually and can use the same effect on multiple objects. After you have created a particle system, the Properties editor fills with many panels and buttons. But do not panic! There are two different types of particle systems, and you can change between these two with the Type selector: Emitter and Hair. The settings in the Particle System tab are partially different for each system type. For example, in Particle System Types. they are shown for only system type Emitter.